In retrospect, it's rather providential that the Pope went to the UN when he did. By acclamation, yesterday the General Assembly of the global body elected Miguel d'Escoto Brockmann, an LA-born adherent of liberation theology and former Nicaraguan foreign minister, as its president for the coming 63rd session, which begins in September. The real catch, however: d'Escoto, 75, is a priest. The president-elect was ordained for Maryknoll before taking a cabinet post in the Sandinista regime of the late 70s. Not that Papa Ratzi would've repeated his predecessor's famous tarmac chew-out of Ernesto Cardenal -- another cleric who took a lead role in Nicaragua's experiment with Marxism. But still, given the assembly president's place on the dais (and especially his role of introducing speakers), the confluence would've added quite the layer of tension to the formalities. It won't be because of his clerical status, but it seems this president-elect will keep things a bit more interesting than usual come early fall's "UN Week," when scores of heads of state pour into New York to address the GA.
"They elected a priest. And I hope no one is offended if I say that love is what is most needed in this world. And that selfishness is what has gotten us into the terrible quagmire in which the world is sinking, almost irreversibly, unless something big happens," d'Escoto said during a news conference. "This may sound like a sermon. Well, OK."
In his acceptance speech, d'Escoto spoke out against what he called "acts of aggression" in Iraq and Afghanistan - without mentioning the U.S. by name. "The behavior of some member states has caused the United Nations to lose credibility as an organization capable of putting an end to war and eradicating extreme poverty from our planet," he said. The remarks drew immediate protests from the U.S.
"The president of the General Assembly is supposed to be a uniter," said Richard Grenell, a spokesman for the U.S. Mission. "We have made it clear that these crazy comments are not acceptable, and we hope he refrains from this talk and gets to work on General Assembly business." D'Escoto has long been a supporter of Sandinista leader Daniel Ortega, who once allied himself with Fidel Castro and the Soviet Union and won re-election as Nicaragua's president in 2006. D'Escoto was foreign minister of Nicaragua for the leftist Sandinistas during the 1980s. Last September, he addressed the General Assembly on climate change as a presidential adviser to Ortega. He told reporters he has always had a "great love" for the U.S., though he acknowledged that he once described President Bush in an interview years ago as an adherent of manifest destiny whose policies had made the world less safe. 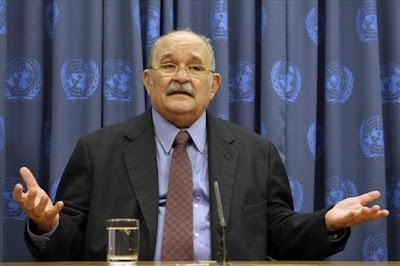 D'Escoto also criticized the veto power the U.S., Britain, France, Russia and China exert over the U.N. Security Council. "Certainly I hope that my presidency will address what has become a universal clamor all over the world for the democratization of the United Nations," he said, adding that some people refer to the U.N. as the "longest-lasting dictatorship in the world."